CALGARY, AB – Housing affordability was front and centre as the federal Liberals announce their budget on March 19 and it promises to be a big campaign issue. This affordability “gap” affects all sectors and ages of the population but has a more serious impact on first-time home buyers and millennials. Marda Loop’s Mantra development, which launched in late February, is offering a solution to affordability challenges for homebuyers. In a recent CMHC survey, price and affordability was the most important factor considered when buying a home. This was a “concern” for 50% of first-time buyers and 57% for repeat buyers. Part of the challenge for homebuyers is that more people are buying on their own. A Statscan report shows the number of people living alone has more than doubled over the last 35 years to one in six. Single-person households are now the most common household type in Canada. That means it’s less and less common to have a two-income household to split a mortgage. More adults are living alone after divorce; millennials are living alone in long-distance relationships; and seniors are still living alone in disproportionate numbers. The desire for one-bedroom condos may be high but the ability to purchase them may not be as strong. Finally, low-income households among millennials still makes homeownership a distant dream, unless developers can offer significant reductions in condo prices. As millennials’ incomes flounder in the face of home costs, there is a significant affordability gap and they look for any way they can to bring the cost of homes down. The introduction of the mortgage stress test added another hurdle to attaining home ownership, especially for young buyers. The Canadian Home Builders’ Association is calling on the Liberal government to reduce the stress test and restore 30-year mortgages for qualified first-time home buyers, saying a longer payment period will reduce monthly payments, making them more attractive and feasible for younger homeowners. If this affordability gap continues, it could lead to stagnation in home sales, and the economy. Unlike many other condo developments, Mantra has an option for one-bedroom suites where owners can choose not to purchase a parking spot with the unit. That means an instant saving of $20,000. Being at the heart of the Marda Loop district, with a superior 89 Walk Score®, tenants no longer need two cars – or even one car. That lets them do away with the cost of insurance, repairs, gas and maintenance, which also costs thousands of dollars a year. For those needing a larger, three-bedroom space, but can’t afford a house or townhome, Mantra has the solution in spacious, 1,400-square-foot three-bedroom suites. This is especially valuable for growing families or those downsizing from a larger home. 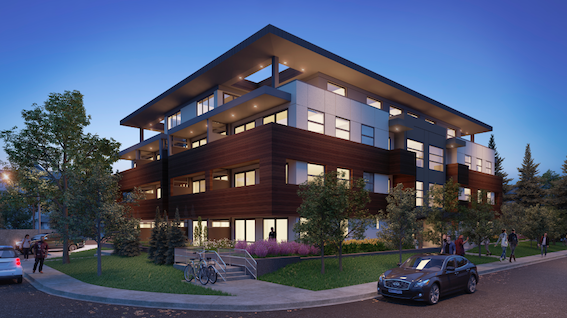 Centrally located at the corner of 21st Street SW and 35th Avenue SW, Mantra will be at the hub of the historic Marda Loop district but on a side street, offering residents a home in the popular neighbourhood. The building will have 33 units in four storeys set to complete in December 2019. Mantra residents will have their pick of local retail and food establishments, outdoor markets and festivals. Numerous schools that cater to children of all ages, a public library and Mount Royal University are nearby as well. Those looking for more athletic activities have a variety of options to choose from such as tennis courts, swimming pools, yoga studios, ice-skating rinks and golf courses in the area. The Marda Loop Business Improvement Association serves more than 130 businesses, and residents are served by the Marda Loop Communities Association. The MLCA has recreational and educational programs for individuals and families and serves as a voice for residents, speaking to City Hall on local issues, such as community development, transportation, parks and green space. Mantra’s building developer is Castera Properties & Groupe Denux, a second-generation family real estate company with more than 40 years of experience developing and managing multi-family properties in Canada and France. The British Columbia-based company has been active in Calgary for the past eight years. It considers Mantra a “state of mind” that residents will be proud to call home. Mantra has a location unlike others in the neighbourhood. Carefully chosen to offer urban, upscale living in the community, it offers maximum convenience, an 89 point walking score, and a quiet pathway out its front door to Safeway, Starbucks and more. Its easy access to amenities, recreation, and transit are all bonuses. The neighbourhood in its self embraces a walkable lifestyle, and use of bicycles is common for families and commuters alike. Mantra has many green features and it’s offering of a free, shared, fuel efficient, electric Smart car for its residents to use when they need to get around on short notice is just one of them. There’s no reason not to consider Mantra as your next new Marda Loop home.